I suppose some fans of The Beatles could look at this latest repacking of five Fabs’ albums released in Japan during 1964 and 1965 as an unnecessary, pricey addition to the ever growing Beatles’ canon, seeing as all the music contained on these discs has already appeared in previous, relatively recent CD packages of one sort or another. Or, this new superbly produced set could be viewed as the gift that keeps on giving from a spectacular back catalog and another chance to celebrate the nostalgia and the ongoing world-wide, 50th anniversary appeal of the Beatles. Similar to Canada in the early days of Beatlemania, Japan was allowed to produce several rather unique Beatles releases on the Odeon label featuring substantial differences in track listings and cover artwork to their United Kingdom counterparts, before A Hard Day’s Night (stereo, although here with a different cover), and Help! (here in “Original Stereo Mix”) closed out the party and Japan was then soon after directed to sync up with the Beatles’ EMI and US album formats. Accordingly, unless you have been a collector of Japanese vinyl through the years – or knock-off CDs – you will be unfamiliar with the track running order on the three completely unique albums in this set. Some will find this refreshing and I’d reckon some will find it suspect as songs flow in a new order to what the majority of listeners are accustomed to, and not just a question of echo or EQ added, or subtracted. For instance, the Japan Box version of Meet The Beatles! (Mono) features an amalgam of tracks from the band’s first two UK albums, The Beatles’ Second Album (Mono) also borrows from the first two UK LPs, but also throws in Can’t Buy Me Love (which also appears here on the Japan version of A Hard Day’s Night.) Both of these albums use the basic US front cover art with minor differences and contain 14 tracks each. The Beatles No. 5 (Mono), which duplicates the US Beatles ’65 front cover (but not the back) is perhaps the most eclectic in its 14 song selection, with tracks coming from several UK albums, EPs, singles and even includes Komme Gib Mir Deine Hand which may have mystified the fans in Japan at the time. But, is this Japan Box from Apple Corps and Universal Music neither fish nor fowl? Here’s an answer: how about a cute, but curious hybrid for the collectors and true believers that will ding them dozens of dollars and plenty of pounds sterling for the privilege of placing it on their shelf. Sure, as far as sound goes – more on that later – we are treated to the already five year old mono and stereo remasters and perhaps a case could be made that using the original Japanese mastering from 1964 and 1965 would have made this set more authentic, if not less ear-worthy. But Apple had already decided with the recent The Beatles: The US Albums box that 21st century masters would be used in these types of re-releases, so to employ an old cliche, basically, it is what it is. And quite frankly, the packaging of this set has got a real ‘wow’ factor and of course the quality is of the typically outstanding nature that we have come to expect from Japanese releases. Whether that and the set’s uniqueness is worth the investment will mostly be a personal decision, although I’m sure as well also hotly debated by the “leave a comment” crew as well. As noted, the packaging is top notch, although for those unfamiliar with the plastic, removable, box outer wrap, one would have to be fluent in Japanese to figure out exactly what tracks were on the albums and for some reason, the OBIs for the albums are stashed in a separate packet, not affixed to the replica miniature LPs. Although there is a glossy red OBI on the box itself. Go figure. Each replica comes with its own plastic, removable sleeve, as well as the original paper sleeve insert (with lyrics), inner sleeve recreation and duplication of the 60s era Odeon label on the CD face. And there is a 96 page booklet with many rare, captioned images of the other, unique Japanese releases, including 27 original picture sleeve singles, eight EPs, red vinyl, and even a photograph of a 1964 EP master tape. Unfortunately, there is no essay giving any background on these Japanese releases and that presumably would have been very enlightening had it been included. As for sound, this set sounds a good as the remasters did 5 years ago, and utilizing the “Original Stereo Mix” for Help! is interesting, but recycled, as it also appeared as a bonus on The Beatles In Mono Box Set, circa 2009. However, it should be noted that some audio enthusiasts believe that no matter the source material, the Japanese manufactured issues are superior to the domestic versions. Finally, is this first in a soon to be long line of Beatles anniversaries, proper value for the money asked? Considering that last year’s US Albums set contained 13 titles, all but two of them in both mono and stereo, and sold for around $100, while this effort only offers five discs at well over $100, the answer is most likely, no. However, just about anything by the Beatles is pop platinum and collector catnip to the fans and I sincerely doubt this set will eventually emerge in any different fashion. Meet The Beatles! The Japan Box is out now. This is £63.43 on Amazon as at 5.45pm on 22nd July! After all the negative comments on this box (even way before it was out), I was near not to buy this box. Then I saw the pictures in The Beatles Blog and decided otherwise. Now I must admit that I was positively surprised when I finally got hands on my copy last week. The artwork is outstanding and I really wished that other replicas were made on this high standard. I paid 125 Swiss Francs which makes about £ 81 (or $ 139). This, in my opinion, is a reasonable price for such a nice box since CD’s from Japan always were costly. People who collect CD’s since the Eighties know quite exactly what I’m talking about here. Yes, this box is kind of an artwork. So what? The replicas look very different from anything you might already own with Stereo, Mono and US-box. That alone made me happy. Oh, and it has real good Beatles music included as well! 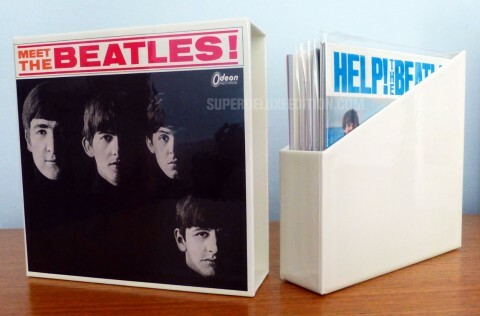 Any serious Beatles collector won’t be dissatisfied with this box, I think. I picked this up at HMV for £84.99 which I think is reasonable for a Japanese box of this type. Very impressed by the packaging, sleeves and booklet, and the set sounds good. I wasn’t buying this set for the music, I got it for the visual appeal, although I’m enjoying listening to the songs in a different combination and although this is most likely my imagination, a few things do sound a little different. I think they should have included the Japanese Beatles For Sale to keep the LP release sequence intact – yes it’s the same track list as the UK album but the sleeve design is different in terms of layout. This Japan box is on the shelf at £84.99 in my local HMV and sat next to it is the US Albums box at £145.99. $200 for 5 CDs that run for about 30 minutes? Not this release in particular, but I suppose it boils down to whether you buy these types of box sets for the music or the artwork or both. I personally want the music more than anything else and the packaging / artwork is generally never looked at again once it has had it’s initial once-over. It is good to have a nice looking presentation box but I don’t want to pay for the packaging rather than the music and that is where a lot of deluxe editions get it wrong between reasonable price and content. Because the box was made in Japan. The made-in-Japan “US Albums” box was also way more expensive ( it did include much higher quality mini LP sleeves). I think this box was originally conceived as a Japan-only release, and then for some reason Universal decided to have the boxes imported out of Japan and sold worldwide. The result? People wondering why the box exists, and why it is so expensive. As again the 2009 audio has been used, this is where this particular box set to me becomes inconsequential music contained in a piece of artwork rather than a box presenting the music within. A very high premium you pay for that artwork too. It is a nicely presented and a very attractive Beatles collectable, but I think it is disingenuous to market this as a ‘music’ item. It will mainly be bought for the replica sleeves and miniaturised artwork so should be sold as visual art. The music seems a distant second in the presentation stakes. I only say that because I believe most people interested in this box will already have the 2009 audio several times over. The price is also very objectionable considering the actual music content compared to the previous Stereo, Mono and US box sets. So why the high price? Rather than another high priced standard CD box with no high-res or bonus content, perhaps a 50th anniversary book with all the details of the various territory releases and corresponding artwork would have been more appropriate as a celebration. As far as the mistranslated lyrics to “Matchbox” go, Ringo didn’t quite sing the correct lyrics either. I always heard Ringo sing “Matchbox hole in my cloak”, as opposed to “will a Matchbox hold my clothes”, and switch out “watchin'” for “wond’rin'” periodically. So we can’t get TOO particular! The mistranslations! They can be quite funny.